Factual error: The final episode of "The Lucy-Desi Comedy Hour" when Lucy meets Ernie Kovacs, marks the finality for Lucy and Ricky Ricardo, and Fred and Ethel Mertz. By this time the shows weren't filmed before a live audience the way it's depicted in the movie. The producers of the show abandoned the live audience earlier than the final shows. 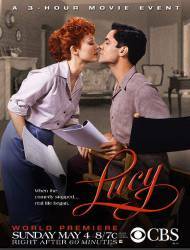 Factual error: Lucille Ball is portrayed as a victim to everyone around her in the film. Actually, she was a strong force to be reckoned with, bold, demanding and some would say controlling; arguably quite necessary with her being the powerful female head of a production company. Factual error: Arnaz told the studio audience at the end of his show's recording that Communists took over Cuba (his native country) when he was a child. That is untrue as it was the Batista rebels that took over Cuba (early 1930s) when Arnaz was a child, not the Communists. The Communist take over of Cuba actually occured in 1959, many years after Arnaz fled the country. Factual error: Contrary to what is depicted in the film, producer Jess Oppenheimer and Desi Arnaz never saw eye-to-eye. They never liked each other personally and professionally. Desi Arnaz: I work hard, I play hard, I drink hard and I love hard.